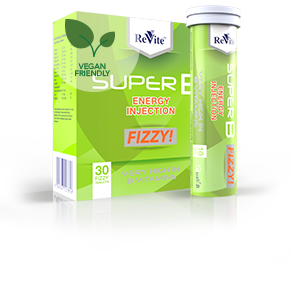 Super B energy injection Fizzy is 100% animal product free. Helps to increase alertness and energy. * Nutrient Reference Value for individuals of 4 years and older based on Recommended Dietary Allowances (RDA’s) which will meet the needs of nearly all healthy individuals to prevent nutrient deficiencies.